A no-nonsense EQ plugin with an impressive level of control, Equalize will find fans amongst mix surgeons. Easy to learn. Top-notch interface. Powerful filter slope shaping. Adjustable phase/latency. Very reasonably priced. Less feature-packed than some of the competition. Competition in the parametric equaliser plugin market has never been tougher, with current alpha dogs FabFilter Pro-Q 2 and DMG Audio EQuilibrium looking practically unassailable thanks to their sophisticated arrays of audio-shaping tools and ultra-slick interfaces. Undeterred, though, plucky upstart Acon Digital has entered the fray with its new EQ, Equalize (VST/AU/AAX). Not only is it very reasonably priced, but it also has a couple of powerful tricks up its virtual sleeves - tricks that could make it indispensable for those who demand the highest possible level of control over their mixes. "Equalize's smoothly variable control over its filter slopes along with the ability to fine-tune phase/latency, will endear it to mixing perfectionists"
On first inspection, Equalize doesn't appear particularly interesting, with a rather dated-looking interface compared to Pro-Q 2's fancy front-end. However, it's certainly sensibly designed. Equalize can run a maximum of 12 bands per instance, and these are added and removed by double-clicking the curve display or via the buttons on the Global panel. Six modes are available to each band: low-cut filter, high-cut filter, low shelf, high shelf, peak and notch. Selecting bands is done by clicking them in the curve display, or cycling through them with left and right arrows in the Band panel, which also features knobs for adjusting Frequency, Gain, Bandwidth (Q) and Slope, as well as a bandwidth-to-gain Link button (proportional Q, in other words - handy for preserving perceived bandwidth) and a stereo setting that's used to assign each band to the left, right, mid, side or stereo signal. The curve display includes both pre- and post-EQ analysers, and the handles for each EQ band can be dragged horizontally and vertically to change their Gain and Frequency, respectively. Pretty standard stuff, but each band also has two sets of extra handles that can be dragged to control Bandwidth - or Resonance in the case of shelves and filters - and, more unusually, Slope. Adjustable bandwidth/Q is a standard feature on parametric EQs, but most only allow a fixed range of slopes. Equalize's Slope parameter can be set anywhere between 3 and 120dB per octave - in comparison, the cutting-edge Pro-Q 2 only offers 12dB increments between 12 and 96dB, so Equalize gets one up on its rival there, at least in terms of pure flexibility. The Global panel houses the Solo and Bypass buttons, as well as the Phase mode (a choice of three) and Latency settings. Along with the Slope control, it's these parameters that make Equalize the interesting plugin that it is. 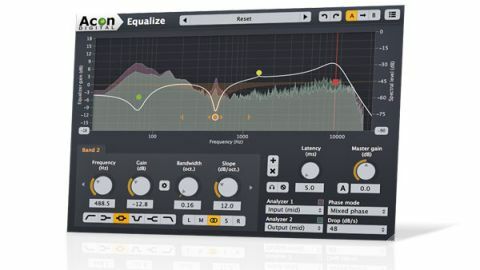 Equalize's smoothly variable control over its filter slopes - something we don't recall seeing on any other EQ - along with the ability to fine-tune phase/latency, will endear it to mixing perfectionists. It doesn't aim to replicate the more unusual functionality of its rivals (Pro-Q 2's real-time EQ matching or EQuilibrium's choice of vintage EQ models, for example) but it's a capable sonic workhorse with a sensibly designed interface that's a joy to use. What's more, it's a steal at the price, making it an easy recommendation for any computer musician looking to boost their mixdowns up to the next level.